It’s Super Bowl Sunday here in the US and for Booze Nerds that means, well, not a whole lot. 🙂 We’re a lot more interested in booze than football. For this week we decided to pick one rum cocktail and try it with several different rums to see what difference, if any, the base spirit makes. We’re always very curious to see how different ingredients affect the exact same drink. We’re also always on the lookout for the perfect drink combination. Not surprisingly, we found that the base spirit makes a big difference and what makes the perfect version of this cocktail depends on what you’re in the mood for. For our cocktail we chose the Golden Wave. This recipe comes from the tireless efforts of Beachbum Berry and was created by Jose “Joe” Yatco who won first prize for it at the 1969 International Bartenders’ Guild competition. If you want to know all sorts of great things about tiki drinks, be sure to check out Berry’s books. The original recipe has you blend the above ingredients with ice. However we here at Booze Nerds typically prefer our tiki drinks shaken rather than as a slushy. Given that this drink isn’t super strong, we felt that blending it would result in it being too watered down. For the falernum we made our own based on Paul Clarke’s recipe. For ours we double the ginger and cloves and don’t add the lime juice because we find it lasts much longer without it. 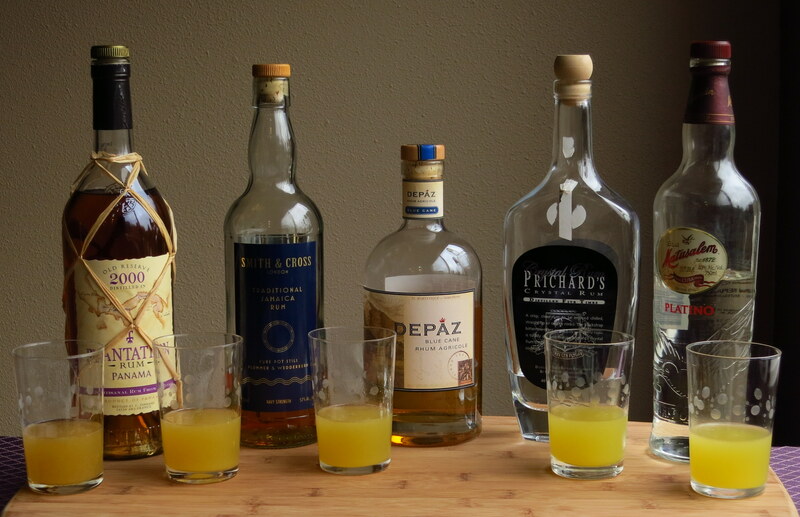 To test out how the rum affects the character of the drink, we mixed up Golden Waves with 5 different rums. We then tasted them side by side to see exactly how the rum impacts the nose and palate. On to the results. Strong sweet/tart citrus start, pineapple on the mid-palate, then a spicy finish from the falernum. Very clean. The lime is very bright. Most refreshing and bracing of the bunch. Would make a good warm weather drink, or as an aperitif, as the acidity would be a palate opener. Also would work well with a rich, fatty meat dish, like a bacon cheeseburger, BBQ, etc. Well integrated citrus on the front. Coconut, pineapple, strong tropical fruit on the mid-palate. Sweet clove, lime finish. Definitely plays up the pineapple more than the others. Lemon, little bit of lime, little bit of orange and vanilla and then hay/grassy notes. Lime, funky/ester-y/resiny notes, pineapple and then the falernum. Grassy notes mid-palate and finish. Darker, woody, toasty notes compared to white rums. Takes the drink off the beaten path. More citric acid notes as it warms up. Lemon, lime, orange, then a big wallop of funk. Sharper grassy vegetal notes. Slight barnyard scent. Very sweet. Spicier clove-heavy finish. More palate coating. More vanilla on the mid-palate and finish. Citrus is much more muted. Not as bright. Ginger bite on the end. Chocolate notes on the mid-palate as it warms up. Also takes the drink off of the beaten path. For being Navy strength rum, this is quite smooth. Clean like the Platino, but richer. Adds nice mouth feel and a richness from the barrel aging. Beautifully integrated, best balanced. You taste all of the ingredients, the rum doesn’t overwhelm but instead really makes the other ingredients shine. Pineapple more noticeable compared to the other aged rums. Provides a great exemplar of the drink if you like your rum drinks old fashioned. This entry was posted in Cocktail, Cocktail Comparisons and tagged depaz blue cane rhum agricole, falernum, golden wave cocktail recipe, matusalem platino rum, plantation panama rum, prichards crystal rum, smith & cross Jamaican rum. Bookmark the permalink.